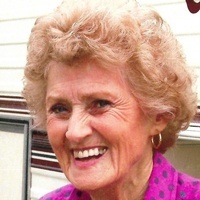 Eva Naquin McNabb, a resident of Kentwood passed away on Wednesday, April 3, 2019 at Landmark Nursing Home in Hammond. She was born March 22, 1934 in Houma and was 85 years of age. She is survived by her daughter, Jo Ann Pitre, Independence; a son, Donald Barousse, Hammond; 4 grandchildren; 9 great-grandchildren; 3 great-great-grandchildren; 2 brothers, Kirby Naquin, Kenner and Joseph Naquin, Metairie. Preceded in death by her husband, Bobby L. McNabb; 3 infant children, Bobby, Keith, and Cheryl McNabb; 4 sisters, Edna Carroll, Leona Perkins, Annie Gautreau, and Rita Savoya; 2 brothers, Andrew Naquin and Percy Naquin; parents, Joseph and Ophelia Naquin. Visitation at McKneely Funeral Home, Amite, from 4 p.m. until 8 p.m. on Sunday and from 9 a.m. until religious services at 11 a.m. on Monday, April 8, 2019. Services conducted by Rev. Don Meadows. Interment Hutchinson Cemetery, Kentwood. For an online guestbook, visit http://www.mckneelys.com. Missions comes in many forms. Giving a Bible to someone who doesn’t have one and teaching them how to use it. Invite your neighbors to your home for coffee and a dessert while getting to know them better. Take a needy child shopping for seasonal clothing or church clothes. I know many people just survive Fridays so they can do weekend activities. Put some effort into making this Friday productive. On the way, he took the Twelve aside and said to them, “We are going up to Jerusalem, and the Son of Man will be delivered over to the chief priests and the teachers of the law. They will condemn him to death and will hand him over to the Gentiles to be mocked and flogged and crucified. Today, I have three prayer requests for you. Five month old Jules Tanksley will be at Children’s Hospital in New Orleans for a heart cauterization at 8 A.M. Please be in pray for her family and the medical staff caring for her. Brett Frazier is in rehab and at the stage where visitors are not allowed as they really introduce Brett to what he needs to do. This is often a hard time for everyone. Pray for the Frazier family today. Pray for those in the nursing homes and those who are homebound. These people are often “out of sight” and “out of mind”. Make this a day to remember them and pray for them. During April, you are asked to donate small stuffed animals. Of course, any items will be gladly accepted. Items can be left in the classroom next to the choir room. Thank you for “tuning-in” each day to read and then to pray. “My old self has been crucified with Christ. Thanks to all of you who prayed for Jimmy Alford and his family. Some of you were aware of my “unspoken request” and some prayed because I had an unspoken request. It was at Jimmy’s request I no longer posted his name. He didn’t like to draw attention to himself. The family was truly blessed by the outpouring of love for Jimmy and his family. I ask that you pray for his wife, Janie, and hopefully she will be able to have the knee surgeries she has postponed for so long while she cared for Jimmy. Pray for Leesha and Shaun and their families. May Jimmy’s family and many friends be encouraged by his example. May God be glorified, even now, by Jimmy’s example of caring, doing, serving, and giving of himself. There are plenty of great articles for you to read today. I suggest you consider making Baptist Press your daily newspaper. That could cause a positive change in anyone’s attitude and daily conversations, as well as being a source of positive Christian information in our world that often seems to omit any mention of God. Many of these articles are of a more local nature. Learn what God is doing in and through our people in our state. My your life shine for Jesus today!